A few hours before the execution of three Bahraini activists, Ali al-Singace, Abbas al-Sami’ and Sami Mushaima, the Bahraini prison’s administration summoned the families of the martyrs in an unexpected call to visit their sons. The regime in Manama carried out the death verdicts on Sunday [January 15, 2017], triggering angry demonstrations across the kingdom mainly in the villages of Diraz, Bani Jamra and Sanabis. 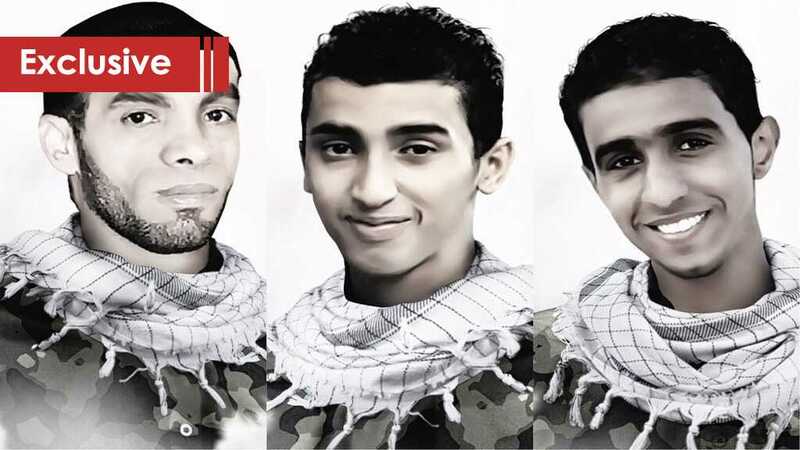 The youngest among them is Martyr Ali al-Singace who was under the legal age, only 15, when he was first arrested before the Bahraini revolution. He was allegedly accused of attacking an officer, and was later released after the breakout of the Bahraini revolution. Ali was later kidnapped at the age of 16 and was threatened with being killed unless he operates as a secret agent for armed militias. The young martyr, who was still a student back then, was soon after sentenced to 5 years in prison for the case of February 14, for which he remained on the run, away from his family. Finally, on the day of the alleged murder of Emirati officer Tariq al-Shihi and two policemen in al-Daih blast [March, 2014], Bahraini authorities stormed Ali’s house. He was detained about a year later and was sentenced to death, along with martyrs Abbas al-Sami’ and Sami Mushaima, for fabricated accusations. However, it is worth mentioning that Ali, his family and all evidences confirm he had not been interrogated regarding the case of al-Shihi’s death. So how could he be sentenced to death in a case he wasn’t even investigated for? 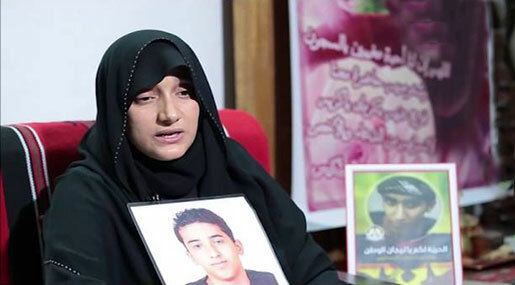 The prison’s administration called Ali’s father, they informed him that at 16:00 they have to visit their son. The family was suspicious of the news since no visits are allowed on Saturdays: “We called the family of martyr Abbas al-Sami’, they also said they have a visit at 14:30, then I called the family of martyr Sami Mushaima, they still hadn’t received any phone call at the time. But they were later informed that their visit is scheduled to be at 13:00,” the mother added. On the next day, Ali’s father received a call at 09:00 in the morning informing him to come take his son’s corpse from a very far area, not in the region where they live. “We wanted to bury him an al-Sanabis but they didn’t accept. We feared that they would bury them some place without knowing anything regarding their whereabouts,” the mom said. Although our sons were executed, people here in Bahrain won’t be silenced and won’t stop their protests. Ali, just like many other ‘opinion detainees’ in Bahrain, received his judgement in absentia. Also like many other innocent detainees, he was subjected to electric shocks, torture and insults to confess committing ‘crimes’ he actually didn’t. Ever since the peaceful popular protests started in early 2011, Manama has provided a heavy-handed security response. The clampdown has cost scores of lives. Later during the popular uprising, the regime called in Saudi and Emirati reinforcements to help it muffle dissent. 1,300 Bahrainis have been arrested and those still in detention have been tortured and denied access to medical care. Hospitals have been militarized as doctors and nurses are harassed for treating victims of the protests. Thousands of workers have been dismissed or suspended from their jobs for taking part in the demonstrations. Meanwhile, as the international community – particularly in the West – has been quite vocal in condemning atrocities committed against protesters in some Middle Eastern countries, things in Bahrain go the other way. When it comes to the injustice practiced against people there, calls from the West for an end to the authorities’ human rights abuses have been rather muted. People who demand freedom would definitely offer big sacrifices, and so is the case of the families of Bahraini martyrs. They well accept the martyrdom of their loved ones. They believe that their sons are in heaven, and that justice would spread some day, when the tyrant would receive his due punishment.